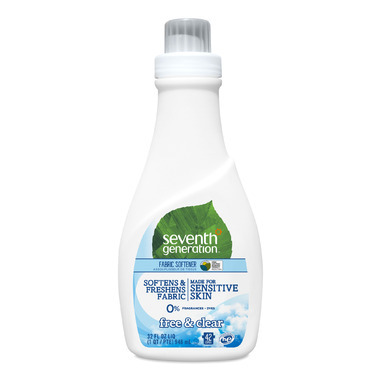 Seventh Generation Liquid Fabric Softener uses plant-based ingredients and essential oils for a cozy softness that will really make you feel good. This Fabric Softeners use a plant-derived softening agent, so you can enjoy naturally soft clothes without wondering how they got that way. Directions: Fill to Medium line (3/4 oz.) for medium loads, for large loads fill to Large line (1 oz.). Add into water, not directly on laundry, during final rinse cycle. Use appropriate dispenser if available. Contains 42 loads as measured to medium dose. It leaves clothes soft and takes away static too. I love that it doesn't contain any harsh chemicals and has no fragrance at all. I have never used fabric softener in my laundry and saw this on sale, so I grabbed a bottle after reading the good reviews. Itâ€™s great! I only use a drop (about 1/3 of the recommended amount) and I notice much more softness of our laundry. Iâ€™ll keep using this. An effective fabric softener with healthy ingredients and without unnecessary fragrance. Will repurchase. I used this in most of my laundry. It works well! Great product. Safe for sensitive skin. Concentrated so good value. Really happy with it. No static, no fragrance, super soft clothes. Used with the same line laundry detergent for newborn baby clothes. The best unscented green fabric softener I have ever used. Clothes come out super soft and static free. Highly recommended! Softens clothes without the smell of fabric softener. Guy approved.